Twitter can be a great place for stimulating ideas. Who would have thought of yogurt custard? Well, following a Twitter conversation with Dom of Belleau Kitchen and Total Greek Yogurt a challenge was born. 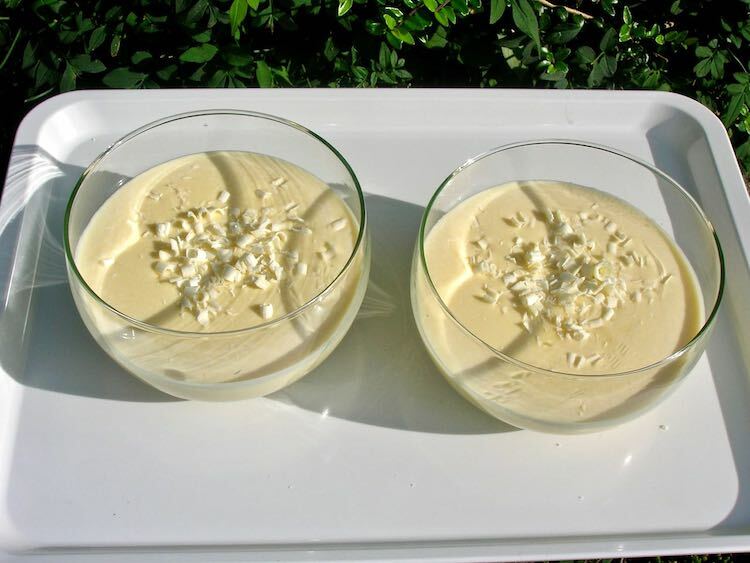 Dom was to have a go at making yogurt custard and I was going to try a chocolate version. Dark chocolate custard was what I had in mind as it would of course be delicious, but at the last minute I decided I would make a white chocolate yogurt custard which I thought would go particularly well with a fruity crumble. As it happened, I never got around to making the crumble. This is a shame as, served hot, this custard would have been perfect for it. Custard is a natural accompaniment to so many hot puddings. I’m thinking how good it would be with my blackberry and apple crumble, this Snowdon pudding or my favourite rustic rhubarb galette. Despite the lack of crumble, the white chocolate yogurt custard worked tremendously well. It made a fantastic dessert in its own right. I served it cold in individual bowls with a little grated white chocolate on top. It was such a lovely tangy and creamy custard and, wise up custard skin haters, it didn’t form a skin. I can see this being made again. Thanks go to Total Greek Yogurt for sending me a “cool” bag containing some of their delicious full fat Greek yogurt. I’m a big fan and use it a lot, both in my baking and with savoury dishes. It’s a lovely treat on breakfast muesli or granola too. You can find recipes for an easy vegan honey almond granola, gluten-free granola or chocolate granola here on Tin and Thyme. I’m familiar with the 500g tub and the smaller 170g size but I hadn’t realised until I was sent one, that they do a 1k tub too – how wonderful is that? 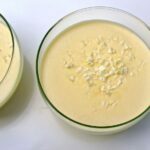 A tangy runny custard when hot and thick when cool. It's perfect with a good old fashioned crumble or as a stand alone dessert in it's own right. Whisk the egg yolks in a pan with the sugar until smooth. Then whisk in the yogurt. Heat the pan gently whisking from time to time to ensure no lumps form and the mixture doesn't get so hot that it curdles. The mixture will thin initially, but keep going until it thickens again - about 15 minutes. Remove from the heat and add the chocolate. Stir until melted and smooth. Use immediately as a warm custard sauce or pour into individual pots and leave to set in the fridge for a couple of hours. Serves 4 as a stand alone dessert or 6 if used as a warm custard sauce to accompany a hot pudding. Thanks for visiting Tin and Thyme. 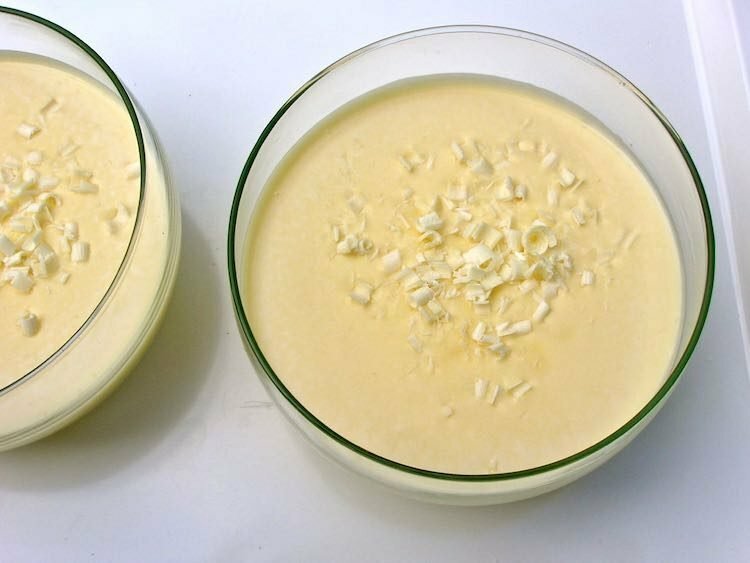 If you make my vanillary white chocolate yogurt custard, I’d love to hear about it in the comments below or via social media. Do share photos on social media too and use the hashtag #tinandthyme, so I can spot them. For more delicious and nutritious recipes, follow me on Twitter, Facebook, Instagram or Pinterest. Thanks to Total Greek Yogurt for providing the yogurt. Thanks to my readers for supporting the brands and organisations that help to keep Tin and Thyme blithe and blogging. Opinions are, as always, my own. Thank you Manu – you too. this looks so incredible… my yoghurt hasn’t arrived yet but the moment it does I can see you’ve laid the gauntlet down… i’m even a little anxious!… really would love a pot of this glorious stuff! That sounds delicious. What a great idea for a simple dessert you can make in advance. I look forward to seeing Dom’s creation too! Thanks Charlotte – always useful to have something you can whip out of the fridge. That sounds really good! It reminds me of Orangette’s white chocolate coeur a la creme – which I have to make again soon! Coeur a la creme sounds a lot more exotic than custard! That looks the business Choclette! Love it! And love total greek yog. Wow I never knew you could make custard out of yoghurt! Who knew!? Amazing, just amazing! I make my own Greek yoghurt (with an Easiyo) and I love the thought of this. I think that’s tomorrow night’s pudding sorted! I’m totally intrigued by the idea of yoghurt custard – it looks wonderful! I adore white chocolate and custard and yoghurt so can’t see how this could be anything but perfect! Wonderful idea Choclette and very yummy too! I love greek yogurt too, a real treat and with white chocolate must be delicious! Great idea – the yoghurt would stop the white chocolate overpowering the dessert with sweetness. Love it. Excellent notion. Much as I love crumble, this would suit me just fine on its own.